id Software technical guy John Carmack says it's unlikely the studio will come out with a new IP in the next decade because it already has more franchises than it knows what to do with. When you think of id, three games immediately leap to mind: Doom, Quake and Wolfenstein. Good reason for that: Those are the only three games the developer has made since 1992. It's not exactly a runaway stampede of franchises but for Carmack and company, it's enough. "We do already have more IPs than we can exploit," the legendary programmer said in the latest issue of Official PlayStation Magazine. "I doubt we're going to do another IP. It's scary to say it, but maybe not in the next decade even, because we want to support Wolfenstein, Doom and Quake - and hopefully we can add Rage onto that - and I don't want five teams here. Three is scary enough." "Obviously if Rage is a success then we'll want to do a Rage 2," he said. "If people love it, you want to give them more of it." Committing to doing nothing new in the next ten years might come across as a bit odd but id seems to have done pretty well with its strategic decisions so far, so if Carmack thinks this is the way to go, I'm willing to roll with it. Besides, it's not as though new IP from id is really "new" in any meaningful sense. Quake and Doom are just about indistinguishable at this point and Wolfenstein is really just Quake (or Doom) with the Strogg dressed as Nazis. 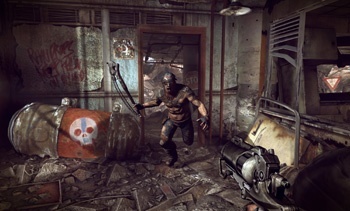 Rage looks cool but I think anyone hoping for much more than a post-apocalyptic Quake (or Doom, or Wolfenstein) is probably in for disappointment. So, no new IP for the next decade? I think that'll be okay. Rage is currently expected to come out next year for the PC, Xbox 360 and PlayStation 3. Doom 4 is in the works too, but no release schedule has been announced.